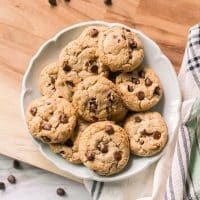 These Brown Butter Chocolate Chip Cookies are the best chocolate chip cookies you will ever taste! The brown butter gives it a sophisticated and bold flavor. Is there anything better than a hot pan of fresh homemade chocolate chip cookies? They just take me right back to my childhood, when my mom would declare that it was time to bake and she would let me crack the eggs, pour in the flour, and, of course, lick the bowl when we were done. I mean, there’s a reason that so many cookie dough foods exist, right? 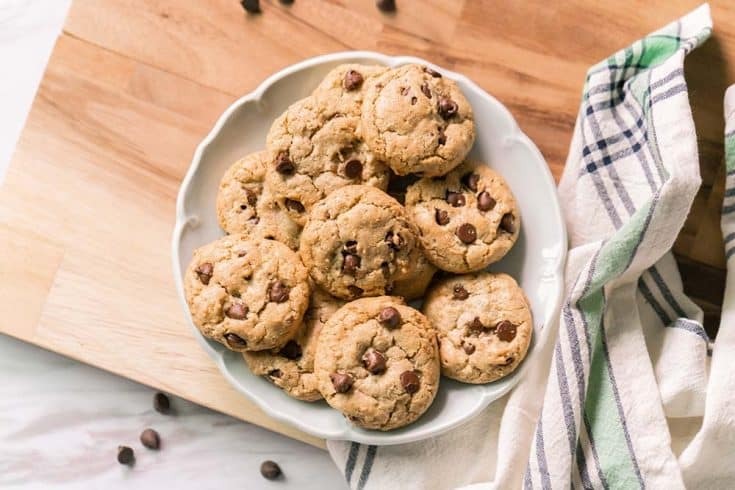 This chocolate chip cookie recipe is my absolute favorite! I prefer chocolate chip cookies that are hearty, crunchy on the outside, and soft on the inside, sweet and salty, and this recipe does the trick. This chocolate chip cookie recipe was passed down from my sister to me several years ago. She got it from a friend at church, who got it from her mom! I love recipes like this! The thing that makes these cookies special is the brown butter. DO NOT skip this step! I prefer to use Irish Butter. I’m not sure what it is about Irish Butter, but I swear it makes everything better! My kids go absolutely BONKERS for these cookies. I like that there are quite a bit of nuts in them. My kids aren’t big nut eaters at all, but they are pretty well hidden in this cookie recipe, but give them just enough crunch to be satisfying! But how do you make the perfect chocolate cookies? Barely beat your eggs. Too much beating will make your cookies stiff. You want nice, soft cookies. Don’t add too much flour. Add it in until the dough pulls away from the bowl. Refridgerate your dough. If you like a cookie with a softer center and crispy exterior, this will help. Good luck with making the best chocolate chip cookies ever! I hope you enjoy them as much as I do! 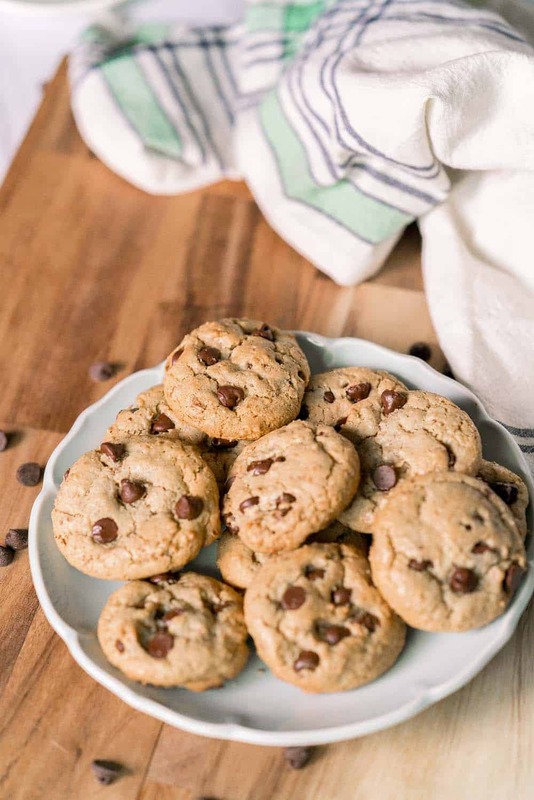 These Brown Butter Chocolate Chip Cookies are the perfect sweet and salty combo that will make your mouth water! In a nonstick skillet, melt 1 stick of butter over medium heat until foamy and golden brown. It will smell wonderful. Pour the browned butter into a bowl to cool. In the same pan, toast the rolled oats and pecans until golden. Blend lightly in a food processor or blender. In a stand mixer, beat the softened butter, browned butter, brown sugar, granulated sugar, salt, vanilla extract, and vinegar on low to combine, then on high speed until fluffy and lighter in color, about five minutes. Add the oatmeal and baking soda and beat for another minute. Next, add the flour half at a time and mix on low speed until incorporated. Add in chocolate chips and mix by hand. 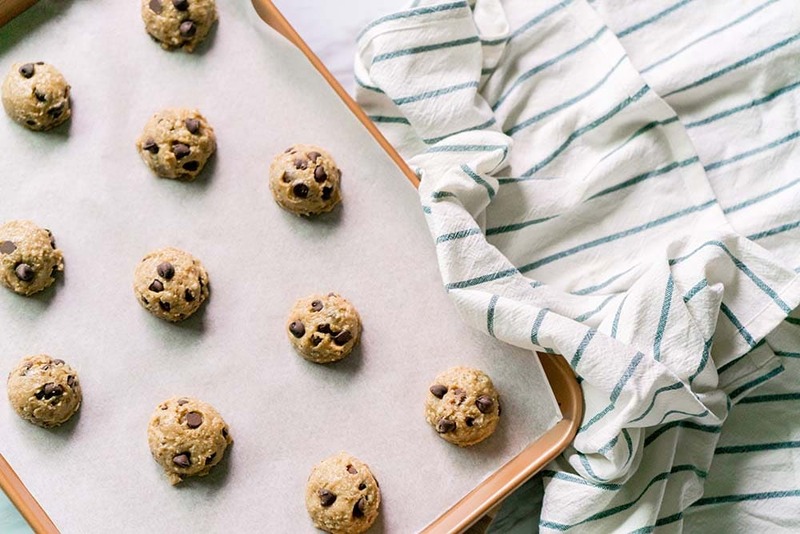 Using a cookie scoop or tablespoon, drop the cookie dough onto parchment paper 2 inches apart. Remove from oven and let sit on the cookie sheet for 3 minutes before moving to a cooling rack. Pin these chocolate chip cookies for later!